He was the chief guest at a glittering function organised at the Leela Palace for the launch of BW Hotelier- a new bimonthly print media magazine and to launch the website with aclick . 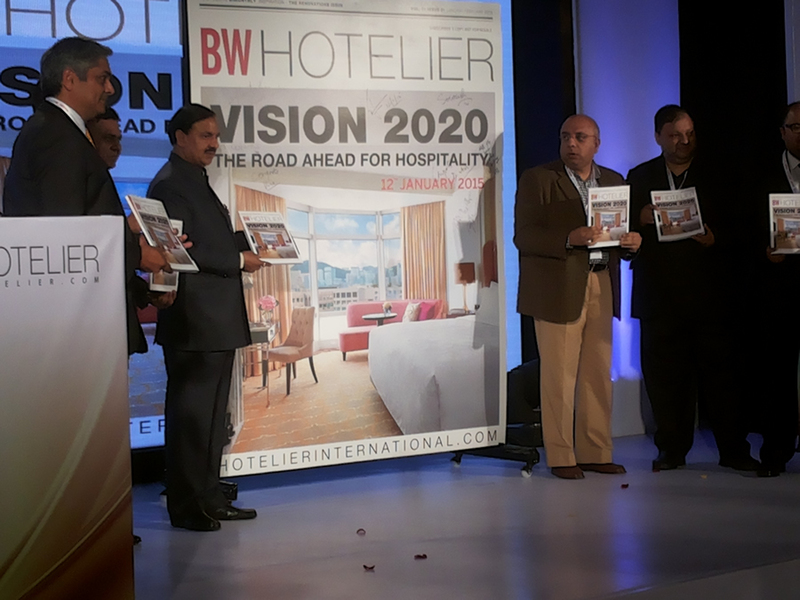 The magazine is a joint effort of Business World and the acclaimed hospitality media brand Hotelier International. Dr Lalit K Panwar, Secretary, Ministry of Tourism, Government of India was the Guest of Honour. Although he did not elaborate how it was to be accomplished, Dr Mahesh Sharma had all ears when he said the government wanted ‘tourism to counter terrorism’ and to generate employment in the country and was a big priority. He also stressed the need for the security and cleanliness of monuments and well-developed connectivity to boost tourism, adding that visitors must return to their countries with a positive image of India. He said it creates a bad impression when foreign tourists see dirt or garbage in a corner and street beggars in the country. He did not refer to the unfortunate issue of rapes and safety of women which is the number one cause of anxiety for tourists, especially the single women travellers but spoke lucidly and with alacrity. Although these topics have been the subjects of his speeches since he took over the Ministry, he came out as a sincere and serious person for the job and left the audience with hope and optimism, especially his indication about the sops for the industry in the coming budget. He requested the industry stalwarts to bring their ideas, problems and challenges directly to his notice. For that purpose, he has even installed a locked collection box, opened only by him and not even his secretary so that any anonymous or sensitive problem may be put across to him. 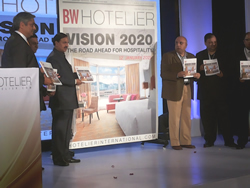 The first issue of BW Hotelier was unveiled by the Minister after his address and a brief video message from Sarah Andrews, editor-in-chief of Hotelier International who said the magazine was a sophisticated business-to-business magazine to be published bimonthly and distributed within the hotel industry. After the minister left immediately after the address and unveiling for another prior engagement, there were two interesting panel discussions themed ‘Vision 2020’. The first one was Mapping Out the Road Ahead’, with K B Kachru, Chairman, South Asia, Carlson Rezidor Group and a hotelier of 38 year standing , Mandeep Singh Lamba, , MD India of Hotels & Hospitality Group, Farhat Jamal, Area Manager (India) & GM, Shangri-La- Eros Hotel in New Delhi and Zia Sheikh CEO, Svenska Design Hotels from Sweden. The lively and interactive (within the panel-no audience participation) discussion veered around to the high infrastructure-costs including high interests with improper structuring of payback, no formalised policies by the government on tourism and no sincere efforts by the government to understand their needs and problems. In fact, Sheikh who was one of the younger members in the panel, wondered where was the need of government bashing as all the government staff had all rushed out with the minister! The general consensus was that the good days were ahead for the hotel industry which needed to be patient. Of course, they pitched for cheaper land in clusters to be identified why the government and cheaper interest rates-ostensibly for now. The second panel discussion was on Old Challenges, New Solutions with Kartike Sharma of the Piccadily group, Kapil Chopra, President, The Oberoi Group, Manav Thadani, Chairman, HVS Asia Pacific and Chairman, WTTC India Initiative, and Saeed Sherwani, Past President, FHRAI. The discussion centered around the challenges ahead for the industry and the panellists’ vision for size and design of hotels for future. As expected, Kapil was bullish on the development of luxury hotels for their market, Thadani optimistic with the budget hotels of Formula 1 formats. Sherwani carried the torch for 3-4 star hotels outside Delhi NCR region and Kartike seemed satisfied with their model of a 5-star hotel with a longer incubation period but away from the big cities with lower land price, citing the satisfactory occupancy of 65% at their Hyatt in Manesar. The conclusion was that there was scope for more hotels in each segment provided a proper business model was developed based on an ROI rather than ROE- Return on Ego which happened with many of the individually owned hotels. The issue of religious, spiritual and medical tourism was also discussed by both panels. So was the constant lag of infrastructure, high interest costs, non connectivity for tourist destinations and the general government apathy to the problems of the hotel industry. The question put by Subhash Arora as the President of the Indian Wine Academy and the consumers’ advocate for wine, was brushed aside. After a strong plea by the hoteliers a decade ago to allow the import of wines duty free- in the name of improved tourism, they managed to get duty- free licenses but most hotels never passed the benefits to the consumers as they were obliged to under the scheme, barring a few like Oberoi or stand-alone restaurants which are more responsive to the market, like Diva Restaurant and the Spice Market. Not only have the wine prices been going North regularly in the name of higher all-around costs to be recovered, many hotels have started getting involved in quasi-legal diversions of these licenses towards the import of cars, carpets and curtains for personal use-in the name of tourism. Coincidentally, the launch and lunch had been organised at the Leela Palace, Chanakyapuri, which has some of the highest mark ups on wines in the industry. However, they did a great job of organising and the lunch with several life stations with Jacobs Creek, Mumm, Chivas and Absolute flowing freely, with a Grand Finale to an excellently organised affair by the hotel as well as the Team Business World.